Washington, DC: Please support Greg Hourigan. Someone who has long been an advocate for good, local beer, and who has long given our business his support, now needs our assistance. A few weeks ago, Greg Hourigan —proprietor of Hard Times Cafe, in Bethesda, Maryland— was diagnosed with leukemia. The craft beer world in the U.S. today sometimes seems spoiled by its current good-beer abundance. Whether its the replenished neophytes or group short-term memory loss: for a beer or brewery of more than three years pedigree, the collective will have moved on to the next newest thing, forgetting or abandoning what came before, much of which remains damn tasty. In the Washington, D.C. suburban area, Greg Hourigan, at his Hard Times in Bethesda, did not forget. Yes, he poured the 'standards, but he also has long been pouring 'craft' beers —local and far afield— often when others were not, and beginning when such things were not always easy to find. Early on, he supported local breweries, and has continued to do so. Here's Hourigan (left) greeting Gary Heurich, in March 2006, who had chosen Hard Times to be the site for the final DC-area event for his Heurich beer. A celebration in Hourigan's honor was held Thursday, August 9th, at Hard Times Cafe, where Greg has long been the proprietor. It was an opportunity for friends and well-wishers to show their appreciation, offer their support, and raise much-needed funds to help defray Hourigan's mounting medical costs. Over 700 showed up, filling the pub and the block of Del Ray Avenue outside, which the Bethesda Police and Fire department had blocked off. Thanking all, Kevin Hourigan, Greg's brother, had hopeful news to report. Is it even POSSIBLE to put into words the beauty of Thursday night's Celebration honoring Greg? Montgomery County Police blocked off Del Ray Avenue; The Liquor Board granted us an outdoor license for the evening; and Lyrics' own Rick Demar emceed the raffles and auctions and provided the crowd of over 700 people with non-stop music! We had SOOO much fun as we mixed, mingled, ate, drank, danced, and shared stories of Greg and days-gone-by. And we raised A LOT of money to help Tenna and Greg with any of their financial needs. I cannot begin to single out any one contributor...you showed your love and support by the hundreds and the entire Hourigan Clan is grateful beyond measure. Greg is continuing his slow road back to wellness and we ask your continued prayers for his physical, mental, emotional, and spiritual health and well-being. ... or contact Gloria Arnold of the Bethesda/Chevy Chase Chamber of Commerce at garnold@bccchamber.org. For updates on Hourigan's condition (and information on where to visit him), go to Caring Bridge. See more photos of the benefit: here. And, a video: here. The parking gods must be crazy. Good beer bar/restaurant Pizzeria Paradiso had invited area brewers and brewery representatives (from Washington, D.C., Maryland, and Virginia) to a Local Brewer Showcase, as a celebration and unveiling of the restaurant's new, larger, beer bar. I was there that evening. The nearest I was able to park my 'beer-mobile' was 4 blocks distant. More photos from the showcase: here. More pics of 'beer mobiles': here. The occasion was a fundraiser for the Georgetown Lombardi Comprehensive Cancer Center. The 'hook' was Pretty in Pink: a Rockin' 80s Rosé Party, a tasting of rosé wines. The host was Screwtop WineBar, a combo wine café and shop, in Arlington, Virginia. Above, three in black were enjoying their 'pink' rosés. And, yes, there was plenty of 'bad' '80s' music as soundtrack. A rosé, though pink, is a dry wine. More from Dave McIntyre, the wine critic for the Washington Post: here. There's no good reason that a 'wine bar' cannot also be a supporter of 'good' beer. Note the tap handle to the right. Caveat lector: As a representative for Select Wines, Inc. —a wine and beer wholesaler in northern Virgina— I was pouring rosés at the tasting. More photos: here. Mad Fox celebrates; more VA breweries open. Mad Fox Brewing Company —a brewpub in Falls Church, Virginia— threw an all-day, SRO, party on Saturday, to celebrate its 2nd anniversary. There were draught and cask ale tappings, a pig roast, live music, giveaways, etc. Blue Lab Brewing, in Lexington. Port City Brewing, in Alexandria. Lost Rhino Brewing, in Ashburn. Wolf Hills Brewing, in Abingdon. The Mid-Atlantic Brewing News lists forty breweries or brewpubs as operating in the Old Dominion; sixteen of them post updates to Twitter. At least one, however —Shooting Creek Farm in Floyd, Virginia— has closed, and two aren't exactly 'craft' breweries: Anheuser-Busch InBev, in Willamsburg, and Miller-Coors, in Elkton. If we expand the penumbra to the DMV —that is, the District of Columbia, Virginia, and Maryland— we see a dozen breweries that can be added to the register of the brewing: three in the District, and four in Maryland. According to the Brewers Association —the lobbying group for U.S. breweries of annual production of fewer than six million barrels— growth of the craft brewing industry in 2011 was 13% by volume and 15% by dollars, compared to growth in 2010 of 12% by volume and 15% by dollars. 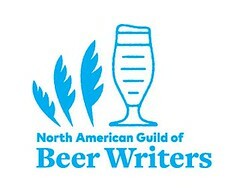 Furthermore, the U.S. was home to 1,940 'craft' breweries in 2011. By May of this year, that total had increased to 2,000, exactly. These are indeed heady days to be a 'good' beer fan, across the nation, and here in the mid-Atlantic region, where other breweries have announced plans to open. Stay tuned; stay thirsty! See a few more photos of the Mad Fox 2nd anniversary party: here. If I've missed any breweries, or if any of the numbers or information above are incorrect, please correct the record by leaving a comment or sending an email. Looking out from a dining room table, at the Heavy Seas Alehouse, in the Canton neighborhood of Baltimore, Maryland. The restaurant, which opened only in February of this year, is located in a re-developed building that once housed the Holland Tack Factory. For over 90 years. Holland fasteners went into such things as major league baseballs, school bulletin boards and sofas. During the Civil War, the building served as a hospital for Confederate soldiers. Maryland law prohibits a brewery from brewing in more than one location. Thus, the Alehouse uses the name, logo, and graphics of the Heavy Seas Brewery under license, but does not itself brew. True to its name, it serves only the beers of Heavy Seas: two cask beers and ten draft taps at any one time. The brewery itself is located a few miles away, in Halethorpe, Maryland. More photos of the Heavy Seas Alehouse: here. 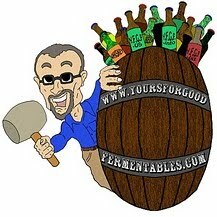 A first: a haiku written for Yours For Good Fermentables, by a friend of the site. Who does not love beer? Written by no one in the photo; it simply seemed appropriate. 3 Stars now brewing; beers due in August. Where there were none, now there are three, Washington, D.C.! Here's today's press release from 3 Stars Brewing Company, which has joined Chocolate City and DC Brau as one of only three production breweries to operate in the Nation's Capital since the 1950s. It’s official – residents of the District of Columbia now have another craft brewery operating at full steam in their backyard. The long-awaited 3 Stars Brewing Company is excited to announce that it has completed the inspection and permitting process, and is now brewing in Takoma, Washington, D.C.
Executive Bar Manager of Pizzeria Paradiso/Birreria Paradiso. “I have been particularly impressed with the care and thoughtfulness they have shown with their collaborative releases, and am quite eager to see what they have brewing for all of us in the future. I hope to be drinking interesting, delicious 3 Stars beers for a very long time." Urban Farmhouse: a Belgian-style Saison (6.5% ABV) with a slightly sweet fruity nose, hints of grass & coriander, and a clean dry finish with smooth lingering citrus notes. The Southern Belle: an Imperial Brown Ale (8.7% ABV) carries subtle notes of roasted coffee, toasted pecans, and oak, with a smooth, yet slightly effervescent, mouthfeel and deep rich malt character. The Pandemic Porter: an American Imperial Porter (9.6% ABV) with cold steeped fresh-roasted small batch coffee added during secondary fermentation. Loaded with a huge roasted malt and coffee nose, and chocolate and roasted malt flavors up front, this porter finishes smooth with lingering chocolate and coffee flavors and balanced malt bitterness. Once released, 3 Stars Brewing Company beers will be available at restaurants and bars throughout DC, as well as some retail outlets, both on tap and in 750 ml bottles. 3 Stars Brewing Company is delivering on the promise of bringing locally hand-crafted artisanal ales to the DC area. The company consists of Dave Coleman and Mike McGarvey, two long time friends who decided to seize the opportunity to produce high quality beer for the District of Columbia – hoping to make this world-class city a world-class craft beer destination. For more information about the brewery, please visit www.3starsbrewing.com. 3 Stars says that its initial distribution will be within Washington, D.C. only, with expansion to the suburbs of Virginia and Maryland to follow at some point. The brewery's current packaging plans are for kegs and 750-ml (25.4 ounces) bottles. The tasting room will open (and brewery tours will begin) once beers are being sold in August. Giant mirror-finished stainless steel baseballs adorn the outside of Nationals Park along N Street SE, Washington, D.C., and reflect the street-scene below.